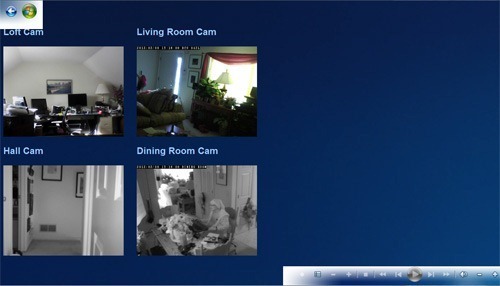 I mentioned viewing my cameras in Smartvue for iPxxx devices in a previous post. I actually posted some details on how to do this and determine the right syntax for your particular camera some time ago. This includes a link to the iCam web app that interactively helps you determine the syntax. Thought it was worth mentioning in this series on DIY Home Security. I also wrote about viewing my cameras from inside WMC. I’ve updated the MCL file and the PNG for the camera and authored an HTML file that I’ve copied to C:\ProgramData\Microsoft\Windows\Start Menu\Programs\Accessories\Media Center\Media Center Programs. For the background color, I added a PNG file that I created. 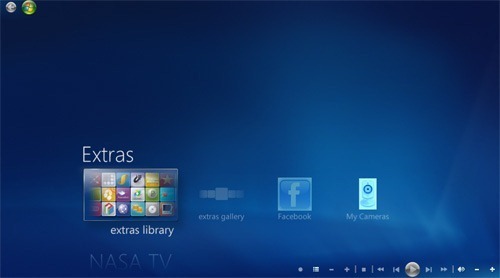 Now I can see the output of my four cameras on a single screen inside the Windows Media Center interface. You’ll find sample source code at the end of this post.